The Daily Float: One "L" or Two? Spring is close. 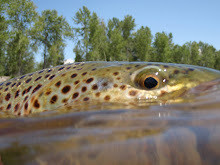 You can feel it in the air, and by the way the trout are starting to act on the Bitterroot. One thing started to bug (no pun intended) me this year though: I've always spelled skwalla with two "L"s and yet I see it,(mostly from my "competition" in the area) spelled skwala. Heck my computer even just told me it's wrong with that dreaded red line under my last spelling of our famed spring stonefly. When I started guiding back in the early nineties, my then boss, the late Paul Koller had always spelled it with two l's. I guess you stick with what you've learned from the boss when starting out in any vocation. It certainly stuck with me, and even though skwala paralella is the full name of this spring stonefly, and the scientific/ Latin/ whatever-name does actually only contain the one L, I find myself looking at it funny spelled that way. Searches on the internet provided me with more than enough crazy entomology survey sites, blogs and fishing websites after typing the bug in as Skwalla! Fewer sites seemed to come up when I entered it as skwala. In the end, you will find it spelled both ways equally as much if you took the time to do so. As far as I can tell, and that more than likely no one, including the trout really care! You could truly spout some serious Latin should you feel the need to on our streams here, as our insect life is as vast, and plentiful as the many rivers and bodies of water we fish. Being as that this is pretty much my all time favorite hatch of the year here, I could certainly not go on spelling it with two l's unless I explained myself. Right? Here's just a couple of my favorite skwalla pattern eating fish from the past couple springs! 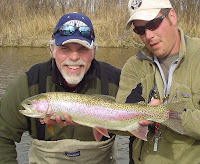 Are you as ready to throw a Dry Fly as I am??? Come get your Fish On!